SALE - 15% OFF - colorful Rooster chinchilla feathers and more - check SALE / CLEARANCE section of our store to see all discounted items. Stripped Reeves pheasant feathers - ready to be used for your millinery and craft creations. Our beautiful natural Ringneck pheasant feathers are now available with Silver Tips. Baby Blue Goose feathers are now available with Silver or Gold tips. Copper tips coming soon! We are so honored to have our feathers featured in the Today show Holiday Decor segment on NBC! Introducing our new Copper / Rose Gold painted feathers. This is a special type of Copper / Rose Gold paint that has diamond like sparkle to it when light hits it - we call it "diamond dust". New addition to our painted feather collection - natural white duck feathers with black design. 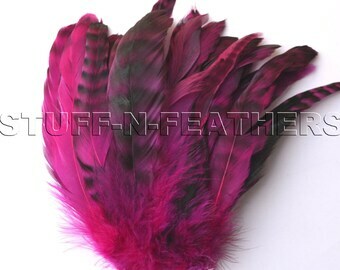 These are perfect medium size feathers between 4 and 6 inches (tip to tip). These majestic Turkey wing feathers are made to order - painted at the tips on both sides of the feather. Available with Silver tips. Our beautiful new creation to spark your imagination - small natural hand selected white duck feathers with black design. Luxurious soft rooster saddles feathers - these beauties are the remainder of our old stock. Amazing quality! Hurry - once they are gone they probably will not be back in stock. Our stripped Guinea wing feathers are back in stock! These beautiful earthy natural rooster saddles are now available wholesale. New addition to our inventory - Ginger rooster saddles. Gorgeous earthy colors, premium quality! Get creative! These small natural Golden pheasant feathers are stunning and inspirational. They are tiny enough for creating jewelry, accenting hair pieces or even invitations to a special event. Memorial Day Sale - use coupon code MD16SALE to receive 20% off your order of $25 or more. A touch of feather can transform your creative packaging! 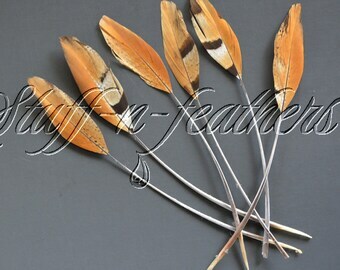 These small pheasant feathers are very subtle yet they are a perfect accent feathers. Add a pop of color to your creations with these natural beauties - red tip Golden pheasant feathers. Now available in 6-8 in range. By popular request larger version (4.5-6 in) of Gold Dipped Duck cochettes are back! Limited quantities available. Our bestselling natural cream rooster schlappen feathers are back in stock! Limited quantity! Gorgeous natural striped rooster schlappen feathers are back in stock! These are soft and fluffy feathers, perfect for accents on packaging, hair accessories and craft projects. These beautiful individually painted feathers with Gold Roses design just joined our exclusive painted feathers collection! Introducing our new Copper / Rose Gold painted feathers. This is a special type of Copper / Rose Gold paint that has diamond like sparkle to it when light hits it - we call it "diamond dust".